Oh Just and Holy Judge, Blessed Son of the Virgin Mary, let my body be calm and my blood be washed so that wherever I may go, the hands of my Lord Jesus Christ be in front of me. That of St. Andrew before and after me. St. Peter's in the back and the middle. Those of the Virgin Mary, that my enemies may come and go with eyes but without seeing me, with arms but without hurting me, and that justice may not apprehend me. That my body be covered with the cloth that covered Jesus Christ's body, that I may not be hurt, or dead, or incarcerated. Oh Virgin Mary, this prayer I say for good or evil that my enemies hold against me. If any sentence be in this day against me, let it be revoked by the blessings of the Father, the Son, and the Holy Ghost. Amen. Thanks a bunch Mama Micki. Is there anything else I should know? I.e. 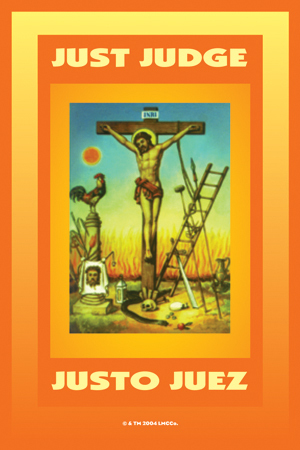 payments for Justo Juez--does he require something similar to what is required for St. Expedite or other saints? The Holy Judge is Jesus. Make a donation to a religious or charitable organization or one that is concerned with justice, such as the ACLU, the Southern Poverty Law Center, or Amnesty International. I am still not clear regarding working with Just Judge. Do I petition to get justice for me or to make the wrong doer pay for his/her wrongdoing? Since I am writing it here, it seems that I should petition justice for my case...am I right here? May my cause be justified with enlightenment from The Son of God, The Heavenly Host, Lord of Lords, --and (whomever) he be held accountable for his actions in all eyes, ears and written orders. Thanks Miss Tammie Lee, I read the previous posts but when thinking (and you know we often do too much) should I ask for justice for me or...I am starting to get some clarity. I appreciate you Triplethreat. Oh, Divine and Righteous Judge, creator of the skies and earth. King of Kings without equal, Judge of such supreme virtue that you nurture our souls, with your paternal power. Oh, my Lord and Redeemer, Rescuer of the Universe, via your infinite love defend my interests from that of all adversaries, guide me, you are my light, my protector and my glory, via your infinite love defend me at all times. Oh, all powerful and most Holy Jesus, bestow upon me a worthy death for all the torment, pain and suffering of your own death nailed upon the Holy Cross. Holy Father prepare me as was done with your beloved Apostles Saint Thomas and Saint Peter, liberate us as you did Saint Mary Magdalene and several other virgins, make my life fulfilling and righteous without rash and reckless decisions, protect me from dangerous paths, cruel prisons, treacherous rivers, all enemies, demonic possessions, thieves, being referred to negatively, being the victim of false testimony. Liberate me Oh Supreme Being from falling into mortal sin – for that is the worst that a Christian can commit on this earth, strip all powers from my enemies whether visible or invisible, never allow my conquering or that of my soul, never may I be within the reach of their eyes (be seen), feet (be located), hands (be apprehended). And as my Judge, protect me from their words, their spears, swords, knives, firearms or any means by which to mortally injure me, only you my Lord, because your you are my Judge, my Father, my Redeemer. Conceal me in that sacred sore at the Divine’s side, and cover me with the Sacred Cloth that covered our most Holy Savior Jesus Christ’s body. My beloved Father that my covered body be protected from injury, death, imprisonment, captivity, and never within reach of the hands of any enemies, may my enemies be overcome/conquered. May the Father free me, the Son keep me, the Holy Spirit accompany and speak for me. I would like to add my thanks to the Just Judge. Thank you, for protecting me from my enemies. Thank you very much for this translation, LuisAlberto72 -- that is very kind of you! We also carry bath crystals, incense, sachet powders, painted bottle spells, holy cards, chromo prints, and statues of the Just Judge / Justo Juez / Passion of Christ. If you are petitioning the Just Judge to bestow well deserved(and possibly harsh) justice to a wrongdoer...is that something one might need to do a cleansing bath afterwards,such as hyssop? I am simply asking that a con man who victimizes and swindles single mothers gets his due now that he has been arrested.I am not cursing him per se,simply asking that he gets what has been coming.Thoughts? the Just Judge is Jesus. You don't have to cleanse after asking him for justice. so i want to work with justo juez supplies against a couple who i know is stealing from their business partner. I am having a hard time coming up with a petition for the candle. Should i just say something along the lines of " may this couple be held accountable for their lies and actions....." or should i be more specific and actually mention in the petition the victim's name and that this victim hold the couple accountable for what is being done to them. I would ask what it is exactly that you want. Are you invested in the idea that the victim be the person who holds them accountable or are you good with it coming from any source? If you really want it to be the victim then be that specific. If not then be a little more general. As for herbs, if you're wanting this person to face legal trouble, you could use Court Case herbs like calendula, cascara sagrada and Little John to Chew (Court Case root). 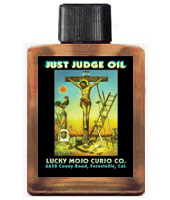 If you order a Just Judge vigil candle from Lucky Mojo, you won't have to add anymore herbs as you have the option to order the candle already dressed with herbs and oils. Is there a specific day of the week you should pray to just judge? I have the judges name is there a way i can incorporate her name into writing the petition? Most of the spells on the forum relating to just judge or court case suggest starting 7 or 9 days before the court date. You can always start earlier and keep the work going till the court date. You can have runs of the candle set at the MISC church to make sure they are burning when you have court. Sunday for success is a good day to set a candle or Tuesday for victory. Light the candle in the morning as the sun rises in the East and the hands of the clock are rising, this is to bring you success in court.